50 Pint Dehumidifier vs 70 Pint. Which is Best? In this article I am going to compare the 50 pint dehumidifier with the more popular 70 pint unit. A 50 pint model is the second most popular choice for use in a medium sized basement but is it always the best option? If you visit the web sites of most online retailers you will find that they simply describe the features of a dehumidifier. They seldom even mention the possibility that a 50 pint model may not be the best to buy, even if it is powerful enough for the size of your basement. A 50 Pint Dehumidifier may match your needs exactly and, even when it is not the best choice you could have made, you may be entirely happy with it. More often than not you have little or nothing to compare it with and it's difficult to make an informed judgement. In this article I want to suggest a couple of reasons why you might question some of the sales copy you may have been reading and invite you to think about whether a more powerful unit would be a better choice for your home. At the end of the day you don't just want an effective appliance, one that keeps your basement dry, you want and deserve an efficient dehumidifier, one that also keeps your energy costs as low as possible. What are the advantages of a 50 Pint Dehumidifier? Is it less expensive to buy? Does it use less energy? 50 Pint Dehumidifier or 70 Pint? We can ignore points 3 and 6. Point 4, the weight difference, is a small advantage but is unlikely to be noticeable to most people; you must decide how important it is to you. Point 1, ticket price, clearly favors the 50 pint unit. Point 5 concerns noise level. In some cases the stated noise level of a 50 pint unit is identical to that of the 70 pint model in the range. Where there is a difference it is typically between 1 and 2 dB. For most people a difference of 3 dB is the minimum they can distinguish. So, we can ignore noise as an issue, or can we? In a given area a 50 pint dehumidifier will run for more hours each day in order to maintain a relative humidity of, say 50%. As the noise difference between the 50 pint and the 70 pint is imperceptible that means that the 50 pint will create more noise interference during a day than a 70 pint unit. A 70 pint unit is more likely to be able to control humidity on the lower or lowest of its fan speed settings. Since the fan, not the compressor, is the main source of noise this reduces the overall noise output of the dehumidifier. If this option is preferred the 70 pint unit will be operating for more hours than it would on a higher fan speed setting but, at least, you have the choice of quieter operation if you prefer. On the question of noise nuisance it is the 70 pint unit that is the best choice for anyone who finds these appliances distracting. Finally, we come to point 2, energy usage. Larger dehumidifiers use more energy while they are operating but are more energy efficient. A 70 pint Frigidaire for example removes 12.5% more water per kilowatt hour of electricity consumed than a 50 Pint Frigidaire. For a fuller account of the "Energy Factor" and how it relates to dehumidifiers please take a look at my Energy Star article. In any given area the 70 pint model will operate more efficiently, and for less time, than a 50 pint unit. This becomes particularly significant if that area is close to the maximum for which a 50 pint unit is designed. At that point the energy savings achieved by the 70 pint unit will be greater than the $30 to $50 difference in ticket price compared with a 50 pint. A second advantage is that a 70 pint, operating for fewer hours per day, is likely to last longer than a harder working 50 pint dehumidifier. The total, annualized cost of the appliance is ticket price + energy cost/working life in years. Using this equation it is easy to see how a 70 pint unit can cost less, as well as causing less noise nuisance. Taking the Frigidaire range as our example once more, the 50 pint model is recommended for areas of up to 1000 square feet while the 70 pint unit will manage 1400 square feet. If the area of your basement is greater than 6-700 square feet a 70 pint unit will cost less to operate overall. The nearer to 1000 square feet your basement is the greater the saving. Of course, the same logic applies to the 70 pint unit as your basement area approaches 1400 square feet and you may wish to look at my article about this to see why a basement dehumidifier may be preferable in such circumstances. The bottom line is that if your basement is more than around two thirds the size recommended for a 50 pint dehumidifier you will save money by choosing a 70 pint unit. You will also enjoy the benefit of reduced noise nuisance. 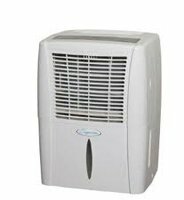 If you do have a smaller basement or other area for which a 50 Pint Dehumidifier would be suitable I recommend the following models, in alphabetical order, as out top five choices. The Alen MDF3-50 is a medium capacity unit suitable for use in any room of the home, including a smaller basement. This dehumidifier is Energy Star® qualified and will provide effective and efficient service controlling humidity in the house, or as a basement dehumidifier. The Danby DDR5009REE is a powerful medium capacity dehumidifier equally suitable for use in a smaller basement or other areas of the home. The DDR5009REE has a lower moisture extraction capability than the 70 Pint DDR7009REE and 60 Pint DDR6009REE and will be an economical choice for a smaller basement if the size of that basement is comfortably within this unit's capabilities. The Frigidaire FAD504DUD is suitable for small to medium sized areas of your house or apartment. It is an Energy Star® compliant, relatively quiet and effective appliance that has been positively reviewed by users. It comes with all the capability needed to control humidity any part your home, including a smaller basement. The GE ADER50LP is a medium to large capacity model capable of a maximum water extraction rate of 50 pints per day. In almost all respects the ADER50LP is identical to the 65 pint model in the GE range, the ADER65LP. This unit will be entirely suitable for any location in the home, including smaller basements. The Winix WDH851 is a medium capacity model with the capability to operate effectively in areas of up to 1000 sq ft. The WDH851 is ideal for use in most areas of the home including kitchens, bathrooms, laundry rooms, bedrooms and living areas. It may also be used in a basement and will be an economical choice for basements up to 700 square feet.